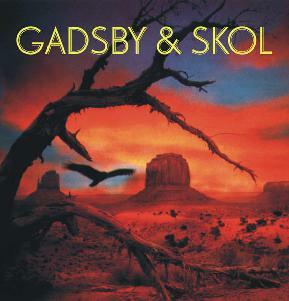 According to the liner notes, Gadsby and Skol was actually around performing in the late 60s/early 70's, but they never recorded anything until reuniting in 1999. Drummer Rick Gadsby handed Nick Solomon and Adrian Shaw a copy of these recordings after checking out Bevis Frond when they played in his hometown of Toronto, they were blown away by it, asked if they could put it out, and here 'tis. It's a good story, and I had high hopes for this one - it's on the usually great Woronzow, the band thanks Blue Cheer for inspiration, and as the intro riff of track one ("Guitar Dog") kicked in I was into it- heavy duty power-trio acid rock, something I can definitely get behind. Unfortunately, after that the record only succeeds about half of the time, often falling deep into stereotypical "dumb" 60's/70's power rock moves, and lacking the instrumental oomph needed to carry it off. This is probably not surprising since after all the band actually wrote all of these songs back then, so maybe I should cut 'em a little slack. This record certainly has moments - the aforementioned "Guitar Dog", "Getting Used To It", and "Fools Like You" are great rockers, and the closing track "Number Six" is an excellent extended workout. They also pull off a respectable cover of their inspiration's classic "Just a Little Bit", which is no mean feat. Good mixed tape (or CD-R) material. One the other hand, some of the other songs I could do without ever hearing again - "Who Calls You" and "I Don't Know" are especially not good, whether they are just meant to be silly and irreverent or not. If you are the type that would drop big bucks on Jade Warrior LPs or something like that you might well love this, but I would suggest buying the entire Bevis Frond back catalogue first if you haven't already. For more information you can visit the Woronzow web site at: http://www.woronzow.co.uk.